In the 1960s, we were both working independently on sand studies: Pilkey with Bob Giles, his master’s student, and Neal, a master’s student with Dr. John Hubert. Giles and Pilkey carried out a regional study of the minerals in beach, dune and river sands of the Southeastern United States (1965) in a follow-up study to Pilkey’s work on the continental shelf and slope (1963). In Neal’s study of Atlantic deep-sea sands, he summarized published data on heavy minerals for Atlantic Coast beach/dune and shelf sands (Hubert and Neal, 1967). Pilkey and Giles collected sand-sample sets at 53 beach/dune locations along the 400-mile stretch of shorelines between Cape Hatteras, NC and Miami Beach, FL, as well as 40 sand samples from the rivers flowing to these shores. The purpose of the study was to characterize, compare and contrast the sands of these environments regionally as well as locally, and to evaluate sources of these coastal sands. The relative contribution of specific minerals to the beaches is in part a function of where the source-rivers originate, either in the Piedmont or the Coastal Plain (Fig. 1). All beaches contain a variety of minerals, unique “suites”, which are like fingerprints in the sand—fingerprints that are clues as to where the sand came from (e.g., inland parent rock types, marine shells, offshore reefs), how far it was transported before it got to the beach, and by what means the sand was transported (e.g., rivers, wind, waves and longshore currents). The sand-sized mineral grains can also give us information on the processes that may alter the grains once they reach a beach. 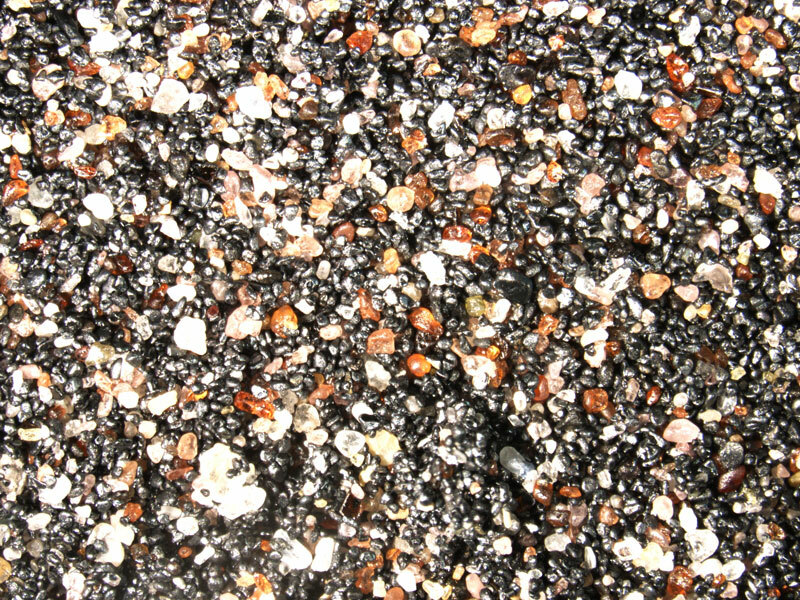 Typically, four common types of sand grains are recognized on beaches: light minerals, heavy minerals, carbonate sand derived mainly from shell fragments, and volcanic sands (e.g., olivine, glass, sand-sized rock fragments). For our purposes along the beaches of the Southeastern U. S., only the first three of these major types of sand grains are important in dunes and beaches (i.e., volcanic sands are found in association with volcanic coasts like the Hawaiian Islands and are not important in the SE U. S.). Light and heavy minerals are defined by their specific gravity. Water has a specific gravity of 1.0. The light mineral quartz has a specific gravity of 2.7 (feldspars are in the same range), while heavy minerals are defined by specific gravities higher than 2.9. 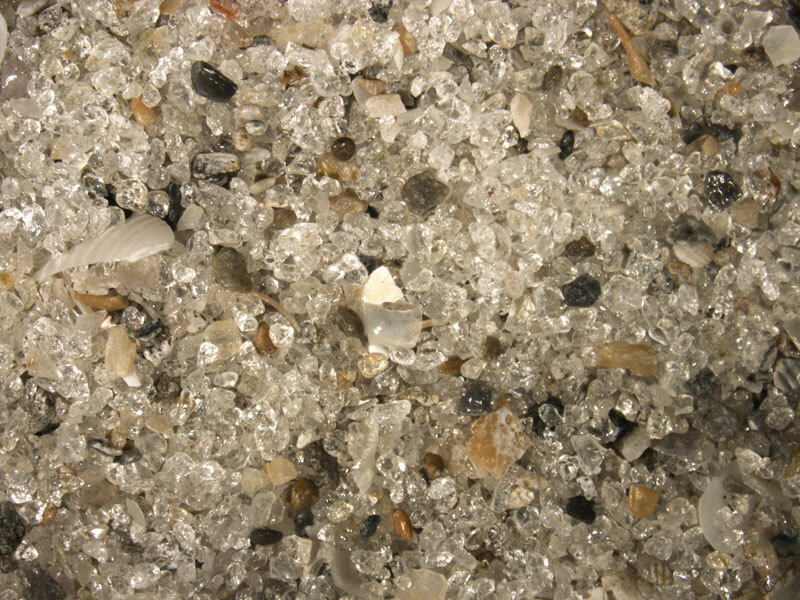 On most beaches, light minerals make up the bulk of the sand volume and, compositionally, quartz and feldspar grains are the most common type of light minerals.The latter reflects the fact that feldspars are the most common rock-forming minerals in the Earth’s crust, and quartz is a common mineral in continental granites and gneisses. Feldspars are less resistant to chemical weathering and mechanical abrasion than quartz, so with time and wear and tear, feldspar is lost from the sand fraction while resistant quartz persists. So quartz sand dominates many beaches in terms of their bulk mineral composition (Fig. 2). 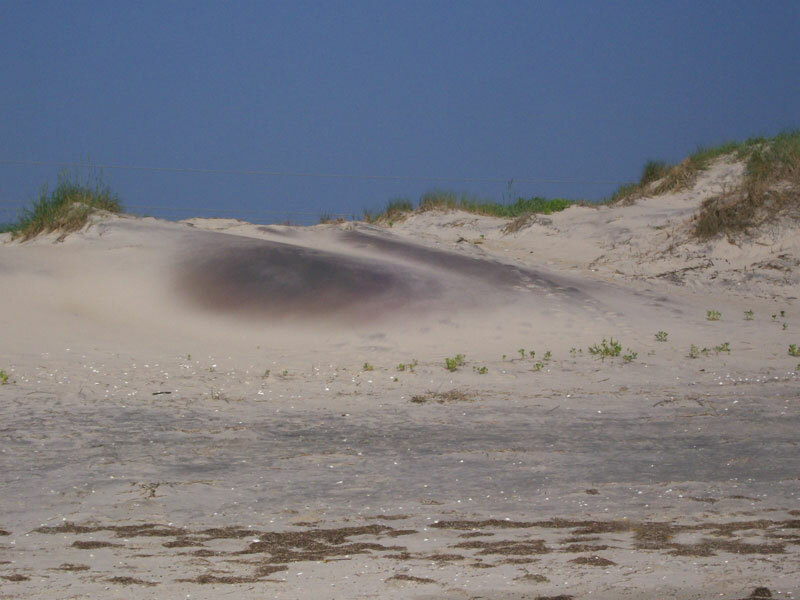 The heavy-mineral fraction of sand in southeastern U.S. beaches is usually less than 5% of the total mineral composition, but the ‘heavies’ are often the most interesting as they are the ‘fingerprint minerals’. Because the heavy mineral fraction is often made up of dozens of different minerals, investigators find them most useful for answering many beach questions. The most common heavy minerals in beach sands, which give the black color to the heavy-mineral fraction, are the opaque minerals, commonly magnetite (iron oxide) and ilmenite (iron titanium oxide). Both have specific gravities above 5 (Fig. 3). Gold has a specific gravity of 19! 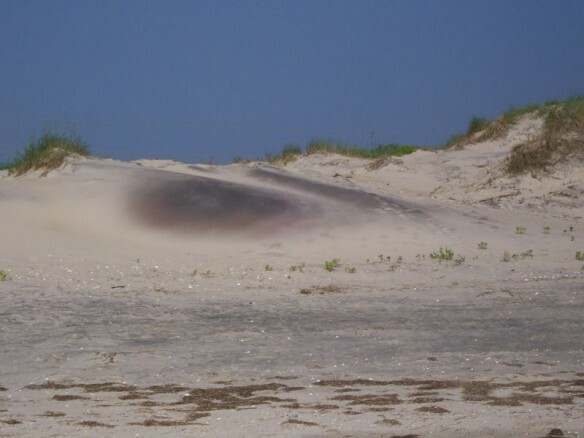 The opaque minerals are responsible for the patches of black sand on beaches (sometimes mistaken for oil pollution)—concentrations of heavy minerals that are examples of natural placer deposits (Fig. 4). The heavy minerals are dispersed through the entire beach, but under the right conditions, placer deposits form. For example, when a wave washes up on the beach, all of the sand is carried forward, but the back wash has much less energy. So the heavy mineral grains are more likely to be left behind because of their higher specific gravity (especially those with the very high specific gravity), while the lighter quartz, feldspar, mica and shelly sands are carried back seaward. Commonly these placers are found on upper beaches, especially after storms. Various combinations of wind and water separate the heavy minerals from the light minerals or other heavy minerals and concentrate them in patches of colored sand, dependent on the dominant mineral (e.g., pink or purple garnets, green epidote) (Fig. 4) (see also Griggs, 2015). 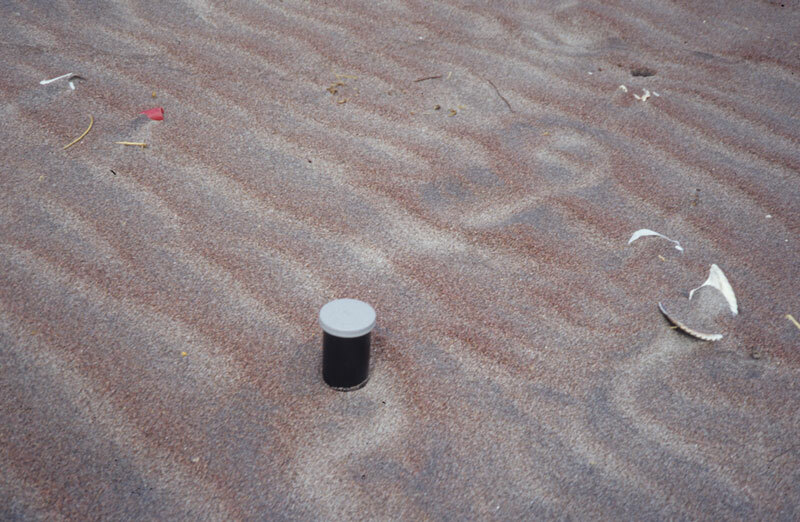 Such concentrates are sometimes seen in the wind-generated ripple marks on the back of the beach (Fig. 5), or where backwash creates crescent patterns around obstacles on the beach. 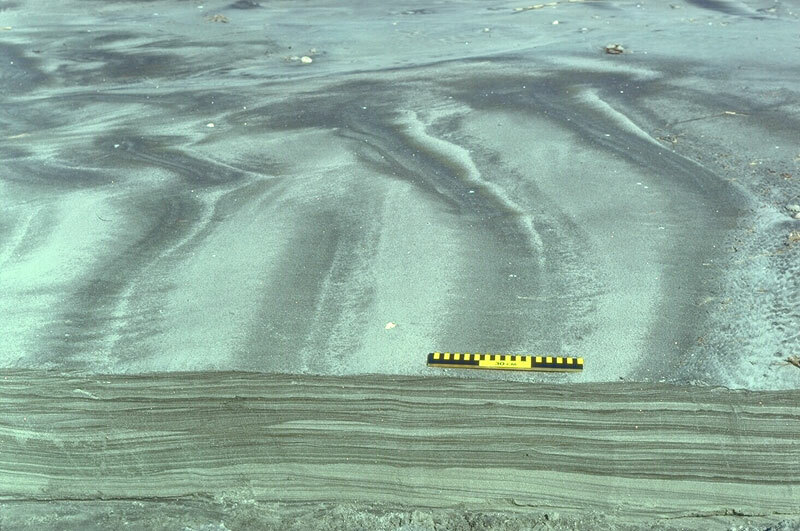 Alternating layers or laminae of light-mineral sands and heavy-mineral sands also enhance the appearance of secondary structures in beaches such as ring structures (Fig. 6), and laminations as seen in cross section (Fig. 4). The third sand type typical of these beaches is carbonate sand, derived from the abrasion and breakdown of marine shells and skeletal material. Coarser shell lags common to these beaches (Fig. 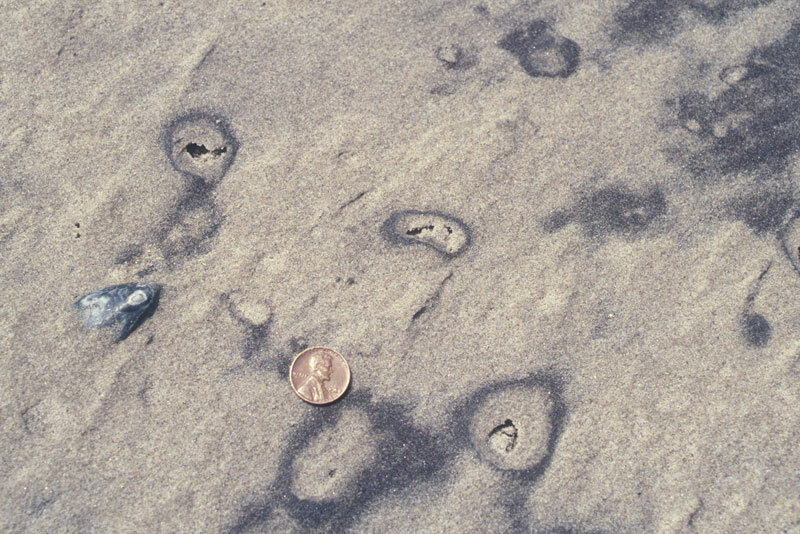 7) are indicative that a variety of clams, snails, and other carbonate skeletal fragments are constantly being broken and abraded into sand-sized particles. Giles and Pilkey found that the most common light mineral in beach sands of the study area was quartz (90%), followed by feldspars and chert. Sand-sized shell material ranged in percentage from zero to 50%. But it was the heavy mineral fractions that yielded the most answers as to where the land-derived sands came from, and their alteration due to weathering and transport. Although heavy minerals at the source of the river sands, far inland, are often more common than quartz, the relative abundance of the two changes as the grains are transported down rivers to the sea. Heavy minerals tend to break up during transport and are also susceptible to destructive chemical weathering. Different minerals break up and react chemically at different rates, which provide a basis to determine relative age differences of sands. Hornblende, actinolite, epidote, and garnet are relatively unstable minerals. Zircon, tourmaline, sillimanite and staurolite are relatively stable. The rivers that begin in the Piedmont Province carry a diverse mineral suite, but one dominated by relatively unstable minerals, while the shorter, smaller coastal plain rivers have higher percentages of stable minerals. In other words, Piedmont rivers usually have a greater abundance of amphiboles (mainly hornblende) and epidote, while Coastal Plain rivers show increases in zircon, sillimanite and staurolite. Other studies have noted similar trends (Windom et al., 1973). Piedmont rivers extend into the igneous and metamorphic rocks and thus start out with abundant heavy minerals, both stable and unstable. The sediment load of coastal plain rivers comes from previously deposited sediments. These grains may have resided in the coastal plain for thousands of years, during which time many of the unstable minerals were removed. In addition, it probably takes longer for sand in the smaller Coastal Plain rivers with gentle gradients to get to the beach, and thus there is more time for physical and chemical changes to alter the grains. Piedmont rivers, with much larger flow volumes, transport grains more efficiently, especially in major floods. 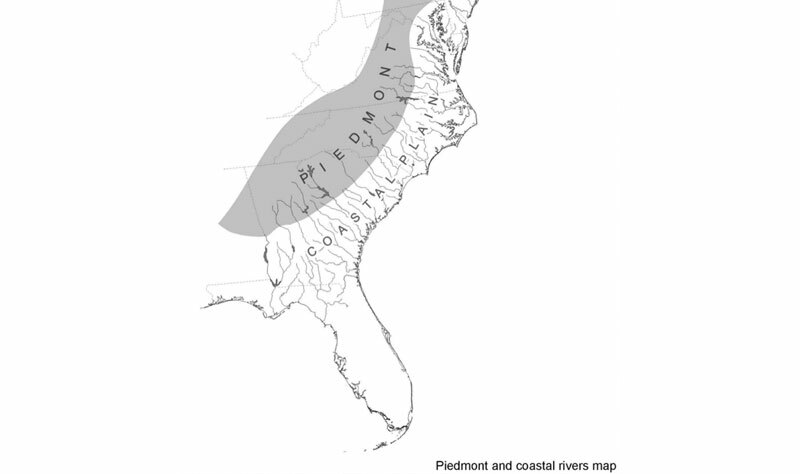 The heavy minerals of most beach sands (except for Florida) indicated Piedmont river sources for the sand, whereas the Coastal Plain rivers provide a relatively small proportion of beach sand, even though the Coastal Plain is immediately adjacent to the ocean shoreline. Generally, today’s rivers are not contributing sand directly to beaches. Instead, the sand load of each river is deposited in the upper reaches of the estuaries, tens of miles inland. There is heavy mineral evidence that supports this conclusion. Mapping of the heavy mineral distribution of the continental shelf (Pilkey, 1963) indicated that the offshore mineralogy does not match the mineralogy of the river sand from adjacent rivers. If today’s rivers aren’t building up East Coast beaches, where did the sand on the beaches come from? We believe that today’s beaches were supplied with sand when the sea level was lower and the heads of estuaries were in the vicinity of the present day shoreline. On the steeper North American Pacific shoreline, rivers empty their loads directly into the sea at river mouths. One ramification of all this is that dams on Southeastern U. S. rivers will not likely impact the sand supply to beaches, but in California the damming of rivers traps sand and causes serious beach erosion due to the cut off of sand supply. The southernmost source of Piedmont river sands along the Southeast U.S. shoreline is the Altamaha River in Georgia. As a result, the heavy minerals in Florida beach sands become progressively more stable (as unstable minerals are removed) going to the south along Florida’s east coast. For example, the average unstable garnet content of North Carolina beaches is more than 10%, while the average in Florida is 3%. And stable sillimanite in Florida beach sand averages a little over 20%, while in North Carolina the average is 12%. The shell content of Florida sand is much higher than that of the three states to the north. 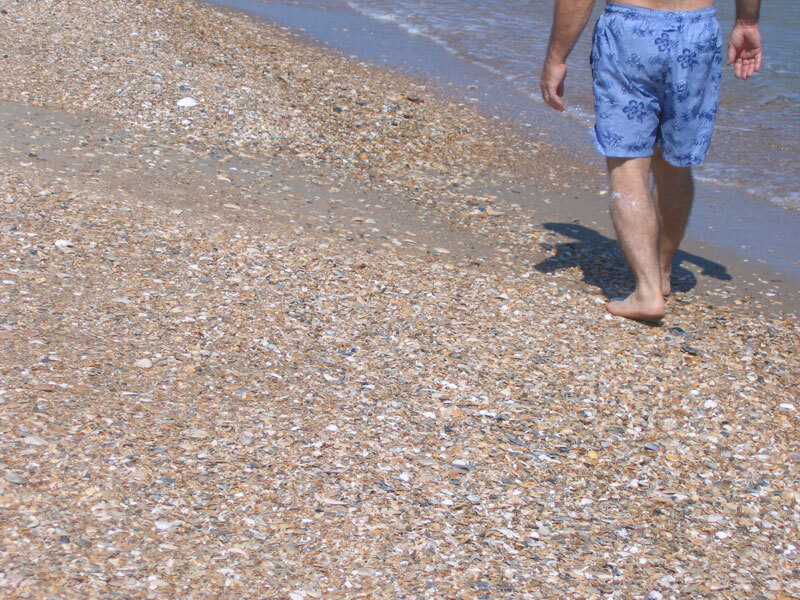 On average, the Florida beaches contain 23% shell fragments whereas North Carolina beaches contain 4%. Perhaps because of dilution by shell fragments, heavy minerals are much less common in Florida than in beaches to the north. Black sand patches on beaches are much less common in Florida. Since this discussion is based on papers from the 1960s one might think that it is outdated, but such is not the case. Prior to 1965, very few Southern U.S. beaches had been replenished, so the beach sands collected for these studies were largely natural and uncontaminated (no artificially added sand). At that time, instead of putting fresh sand on the beach, a more common way to respond to shoreline retreat was to build seawalls. Replenishment came to the fore when shorelines began threatening more and more houses and when it was discovered that seawalls destroy beaches. Today many beaches have been replenished multiple times using sands from several sources that may or may not be related to natural processes that bring sand to the beach. For example, for years Virginia Beach, VA, trucked sand from miles inland to their beaches. The sand source was a 120,000-year-old shoreline deposit, from a time of higher sea level—sand which was weathered for all that time and had changes in its mineralogy, as discussed above. Myrtle Beach, SC, is not on a barrier island and as the shoreline erodes, it is contributing sand to the beach from the same previously deposited 120,000-year-old shoreline mined by Virginia Beach. Edisto Beach, SC, was replenished using very muddy and shelly sand obtained mainly from salt marshes behind the island. And replenishment projects for parts of the North Carolina shore have come from offshore ancient sand deposits which again have a different mineralogy than the original historic beaches. We now live in a time that some like to call the Anthropocene—a time when human activities are altering the Earth’s ecosystems to the point that the alterations are recognizable in the geologic record. The fact that we can no longer do a beach/dune sediment study of the original natural conditions in many parts of the world because of the alteration of these environments is a reflection of this time. And if such studies have not been done in the past, then it is difficult to establish base lines against which to measure our impact on ecosystems. Giles, R. T., and Pilkey, O. H., 1965, Atlantic Beach and Dune Sediments of the Southern United States: Journal of Sedimentary Petrology, v. 35, p. 900-910. Hubert, J. F., and Neal, W. J., 1967, Mineral Composition and Dispersal Patterns of Deep-Sea Sands in the Western North Atlantic Petrologic Province: Geological Society of America Bulletin, v. 78, p. 749-772. Pilkey, O. H., 1963, Heavy Minerals of the U. S. South Atlantic Continental Shelf and Slope: Geological Society of America Bulletin, v. 74, p. 641 -648. Windom, H. L., Neal, W. J., and Beck, K. C., 1971, Mineralogy of Sediments in Three Georgia Estuaries: Journal of Sedimentary Petrology, v. 41, no. 2, p. 497-504.